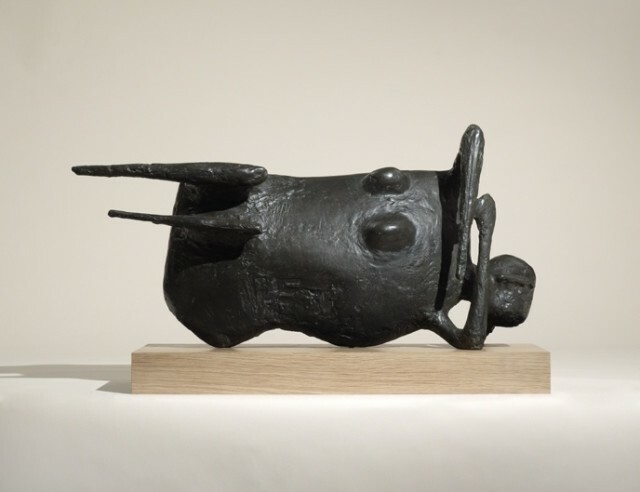 Kenneth Armitage was one of a group of young British sculptors, including Butler, Chadwick, Paolozzi and Turnbull, whose show at the Venice Biennale in 1952 took the international art world by storm, signaling a new anti-monumental, expressionist approach to sculpture. Armitage's signature style from this period - attenuated figures, often huddled together in groups, with their rough, incised surfaces and sharp flat edges - was seen to capture the anxiety and uncertainty of the Cold War era. Despite this early success, in the 1960s Armitage began to experiment with new materials, such as aluminium and plastic, and with new styles, influenced by such diverse things as Japanese dolls and Egyptian tomb sculpture. His work became more abstracted and hieratic, although always remained centred around the human figure that was his constant inspiration. His work can be found in major public collections throughout the world, including the Tate, Arts Council & British Council Collections, MOMA, New York and The Peggy Guggenheim Museum, Venice.